To successfully make a bong or pipe, you need three things: a bowl, a smoke chamber, an ash keeper and a pipe. 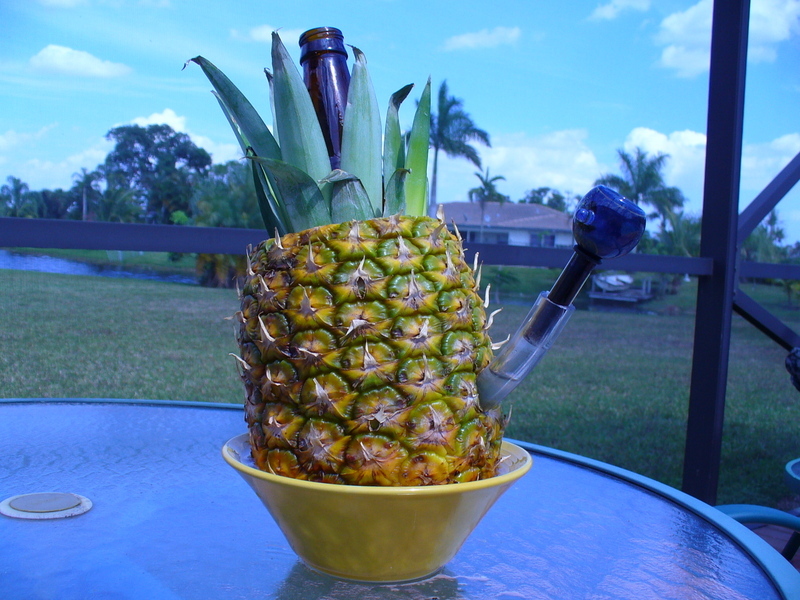 This means that many versatile everyday things can be converted into bongs. The most popular are made of glass and take on many iconic shapes and designs. From extra tall skulls to empty fancy liquor bottles, bong enthusiasts have found many ways to enjoy the pleasure of smoking. There are some bongs, however, that completely go off the charts. They are made from things that have a long-standing innocent reputation in our minds, and the disruption of that image is enough to permanently corrupt the object itself. Sometimes, they are made from whatever is available and are simply a matter of being creative. The following seven bongs meet both criteria. They are inventive and they shatter age-old images. Pineapples bring such fond visions of beaches, tropical weather, sweet mixed drinks and loads of bright sun. Wrapped around the beer bottle that poses as a bong, though, it earns a new bad boy reputation. The top of the pineapple is chopped off and the inside is removed. The beer bottle is stuffed upright into the top and surrounded by tufts of organic pineapple leaves. A hole in the side of the pineapple makes room for the bowl. The Starburst bong is ingenuity at its best. A chewy, candy-like fruit square can be piled against other squares, hollowed, and shaped into a bowl for smoking. It is almost scary that this is possible, but many have helped themselves to sweet inhalations once removing the squares from their wrappers. There is no verdict yet on whether the taffy chew melts when it is lit. You would think that all the sugary commercials showing small kids kissing on Mr. Potato Head and singing, “I Love You” could not corrupt his image. Avid bong smokers have found a way to do it, though. His hollow head makes an impressive smoke chamber. The beloved childhood friend’s mouth easily converts to hold a bowl, and it is fairly simple to construct a pipe through the top of his head. There is something to be said for using what you have at your disposal and being inventive. The person who can turn a sneaker turned into a bong must be a genius. Most people would probably have to see this idea at work to actually believe it is possible. Of course, the smoke chamber is inside of the shoe, and a pipe can be inserted through a hole in the sole. Once it is lit, it looks as if the shoe is on fire, but the person who is smoking it has found a multiple use for rubber, leather and lace. Anyone caught with a baby bottle bong in their house might expect a visit from child protective services. The nice toy blocks, bunnies and rattles motif are a big break from what is inside the bottle. Imagine how traumatic it would be if the baby thought he were getting milk from this and tried to turn it up to his head. There probably would be a huge safety issue with this design, too, if the bottle were made of plastic. This gives new meaning to kissing someone’s bottom. This ceramic pipe is a figurine of a woman kneeling and elongating her back. The bowl end of the pipe sits on the back of her head, and smokers can take a draw from the opening in her bottom. It is a little racy but sure to be the center of any conversation for smokers. At only 11.8 inches in size, it is intended for one person to smoke. It is beautifully sculpted and easy to covet, but there is a serious design flaw with the ice chamber bong. The moment anyone takes that first hit, the smoke chamber turns to dirty water. Bong water is just not as fun to inhale as the smoke. The person who chooses this bong needs to decide if seeing something pretty is more important than getting more than one hit.